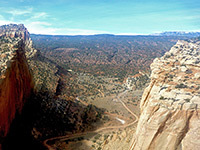 One of Capitol Reef's lesser used paths, the Golden Throne Trail climbs the crumbling cliffs and benches on the north side of Capitol Gorge, gaining 700 feet over two miles to a viewpoint below a conspicuous, golden-brown Navajo sandstone dome, the red-topped summit of which is nearly 1,000 feet higher. Along the way are frequent views over the upper part of the gorge, and, towards the end, of the sloping, reddish lands west of the reef, with the Aquarius Plateau in the distance. The round trip takes little more than an hour, and the path makes a nice contrast to the adjacent and much more popular Capitol Gorge Trail, which stays enclosed all the way, lacking any wide-ranging vistas. 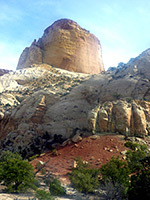 The only other maintained route to the top of Capitol Reef is the Frying Pan Trail further north, but the Golden Throne Trail, while not climbing as high, gives nearly comparable views. Trail map for Capitol Reef. 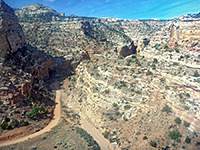 The Golden Throne Trail begins at the side of the parking lot at the end of the unpaved, 2.5 mile road through the upstream section of Capitol Gorge, a route fine for all vehicles under 27 feet. The road penetrates about 2/3 of the way through the reef, though the former wagon route, now replaced by the Capitol Gorge Trail, went all the way through. The path to the Golden Throne heads back west, up the north face of the gorge, climbing steadily but fairly gradually, and staying on the same inclined layer of the Kayenta Formation all the way to the end point, which is on a plateau at 6,100 feet, directly below the throne and about a quarter of a mile distant. The path curves around four promontories and crosses three steep, narrow ravines, giving good views down to the road. 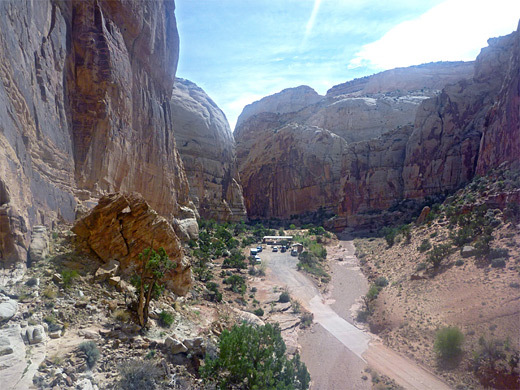 The surroundings are a typical Capitol Reef mixture of big and small boulders in many different colors, together with a selection of cacti, yucca, wildflowers and pinyon-juniper pine trees. The end point, marked by a cairn and NPS notice, is close to the inside of the reef - one more wide bend westwards would reach a final promontory, but sheer cliffs below the Golden Throne put an end to further travel in this direction.